For years, Lord Benjamin has wondered if a man could satisfy him the way that no woman ever has. Now he has decided to take the bull by the horns, so to speak, and find out one way or another. He visits a gaming hell well-known for a clientele of men who enjoy the company of other men. It’s there he meets Cavin, though Ben has no idea that he is actually a small time thief hoping to score a little money off of their encounter. The two men hit it off right away, and it’s only a short time until they’re getting physical in a hotel room. Their encounter is everything Ben ever hoped intimacy with a man could be. 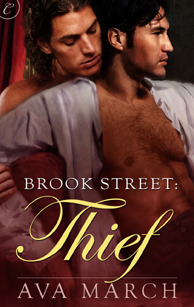 It’s so good, in fact, that Cavin can’t bring himself to steal from his new lover. Soon after, Cavin begins to turn his life around, but he feels himself to low too ever be really be with the Lord who has stolen his heart. Thankfully, Ben has other ideas. I really enjoyed this novella. Ben’s sexual initiation is so well done. It’s incredibly hot and completely believable. And as for the relationship, I was grateful that we didn’t jump straight into Love, but first enjoyed attraction and friendship between the men. Cavin’s self-loathing was also a win for me. I love stories where a man feels himself beneath his HEA. It’s always so gratifying to watch them learn they are worthy of love. Very good. A little more than 4 stars.